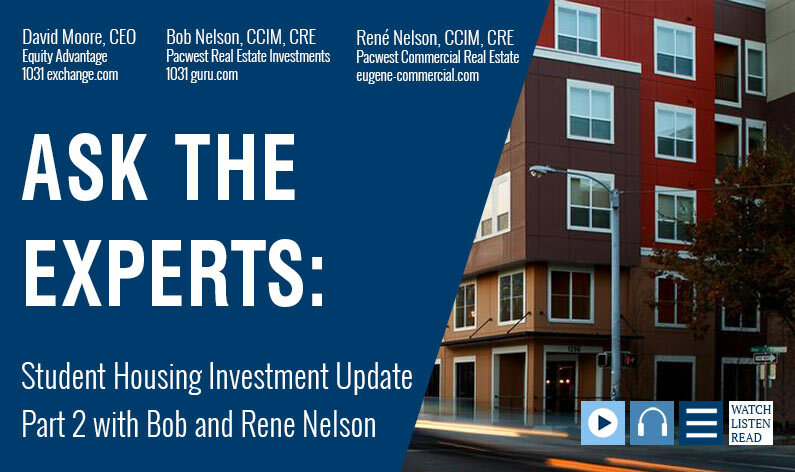 In this episode of Ask the Experts, David Moore of Equity Advantage welcomes guests René Nelson with Pacwest Commercial Real Estate Investment and Bob Nelson with Pacwest Real Estate Investments to discuss sweat equity, rental increases, and amenities for student housing investment properties. I just wanted sort of get your perspective because I know René you’ve worked on some projects, some ground-up big projects that have been very well received and been lucrative for the initial developers, and then we’ve got all the value-add stuff out there is sort of what I always looked at, sort of the BC property stuff. Not the stuff my dad would like to point out to his tennis buddies. Says, “Yeah, I own that.” Putting money in your pocket is better than putting money into a sign on a label I guess. What are your thoughts on those two things and what do you see happening here and is there … I mean you’re talking about obviously 1031’s domestic property for domestic properties, you can go anywhere in the country. There are places that are interesting and… what do you see happening? René Nelson: We are still seeing a pretty healthy market in the Eugene market. There’s a lot of student housing developers that are interested in putting up some fairly large buildings in the University of Oregon area. My sweet spot is value add, and the reason that I say that is I see a lot of mom and pop operators who have rolled up their sleeves and have earned every dollar that’s in their bank account. That just means a lot to me because of their work ethic. They may not have swung the hammer, but they’ve managed the properties, they’ve unplugged toilets, they’ve mowed lawns as they’ve built their eight plex into a 20 plex, and now they own 14 different apartment complexes. I just see those mom and pop operators and the players that go in and do the value ad, and a lot of times for a value ad, it may be as easy as going in and spending four, five thousand dollars per unit, putting in a new kitchen, a new bathroom, ripping out gross carpet because a lot of tenants really don’t like carpet. They prefer those laminate floor type finishes so that it feels a little cleaner to them, and you can go in pretty economically and put a four, five-thousand-dollar finish in an apartment complex and then raise rents. David Moore: So, they manage their own units or they have them professionally managed and they’re not bugging ’em? René Nelson: Both. I find a lot of times they’ll tell their manager, just leave it where it’s at but there’s sometimes they’re a hundred and fifty, two hundred dollars under the market of what current rents are. René Nelson: Do you want to add to that, Bob? I mean we look at that a lot. Bob Nelson: In some instances, it’s good to keep it up to speed. Decent carpet, the kitchen and the bathroom is always the focus. And also, I need to tell you, internet receptive nature is gigantic. If you’re dealing with millennials and you don’t have an opportunity for high speed internet, you have a problem. That’s absolutely going to be a problem. David Moore: (laughter) Yeah right. René Nelson: So, we see that a lot in the campus area where the landlord will offer free internet to the students as an incentive or a concession, but then what the landlord experiences is all the students are connected with iPhones and tablets and iPads and stuff and so then they have black spots where their WiFi doesn’t work and then their tenants are disgruntled. Bob Nelson: That does not go well, right. René Nelson: It’s just been a complex situation in the last two years for a lot of student housing owners who offer free internet. They’re realizing that may not be such a good thing to try to offer anymore. David Moore: So just as your leverage as they say when your cable goes out, the first person out there fastest thing to get fixed in your house is cable these days. Bob Nelson: Back when I was a student, we were hoping the toilet worked, let alone the internet. David Moore: That’s funny… Well on that note we’re going to sign off for now. Knowing the best plan for 1031 exchange with student housing investments takes a professional, and you can count on the whole team at Equity Advantage to help. Your investments are just too important not to have an expert on you team. Give the folks at Equity Advantage a call, 503-635-1031, to get started!